Curriculum Vitae (commonly abbreviated, of course, to CV) is the Latin expression for “the course of one’s life”; but this can seem a bit misleading since no employer is interested in knowing every single detail of your life so far. It’s not an autobiography, after all. The best way to look at a CV is to see it as a “marketing tool” or a “sales brochure” where you sell your skills, qualities, expertise and potential to a prospective employer. Your CV will be the first thing that a prospective employer will see about you. It is also the only part of the selection process that you have full control over. You decide what you write or do not write in your CV. No one can force you to add or remove anything. The chronological CV: This type of CV lists down the candidate’s information in chronological order (i.e. starting with the most recent). This is the chosen format for applicants who have a number of years of work experience; do not have any employment gaps or who wish to present their career progression to date. The functional or skills-based CV: This type of CV focuses more on the candidate’s skills, abilities and personal qualities rather than employment. This type of CV is suitable for students, graduates and young professionals with little or no work experience. 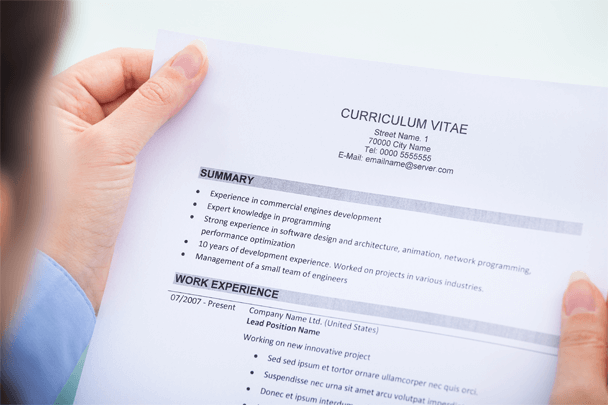 It is also the most popular CV format. The hybrid CV: This type of CV is more or less a combination of the chronological and functional CV. Please note: CVs vary in length. When do I need a CV? It is a common myth that you don’t need a CV to apply for many jobs. When making speculative job applications (i.e. sending your CV and cover letter to an employer and enquiring whether they have any job opportunities available at their organisation). Some people mistakenly think that the purpose of their CV is to get them a Job. This is not exactly accurate. Unfortunately, it just does not work like that in the real world. Rather, the key purpose of your CV is purely to convince a prospective employer of your employability and to arrange an interview or a meeting with you. A CV is primarily a gateway to an interview. While it is true that it is during the interview stage that you have the opportunity to fully convince a prospective employer of your suitability for the job, it would be wrong to conclude from this that the expiry date of the CV is just until the job interview stage. In fact, once all the short-listed candidates have been interviewed the recruiters will then go through all the notes, application forms, cover letters and CVs to make a final decision. Hence, your CV will be your companion until you have secured the job that you seek and its importance cannot be overstated. A CV, or curriculum vitae, is your personal marketing tool containing information about your education, employment, personal qualities and skills. You will need a CV to apply for jobs. There are a number of different types of CV formats that one can adopt, depending on the candidate. The purpose of a CV is to convince the prospective employer of your employability and to invite you for a job interview.